Building on a foundational practice as a studio potter, largely working on functional pots, Christine has become increasingly interested in more sculptural forms and experimenting with a combination of glazes that compliment black, grey and red clays. 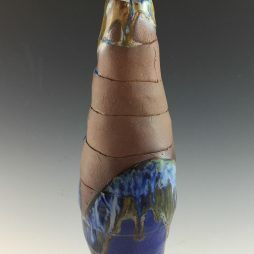 Christine builds vases using strips which is a more contemplative process than throwing on the wheel and is very connected to her moods, her whole sense of being at one with the clay. Early ideas of form and design fall into the background during the process so that an organic space opens up, into which she flows. Paying attention to the finished form and imagining how the particular shape will be glazed. This is her ongoing narrative with clay which offers endless possibilities and wonder, moment upon moment of creative potential, discovery and growth.